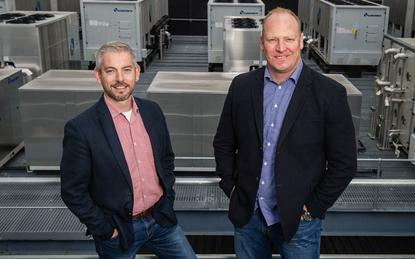 Microsoft's James Kavanagh (L) and Canberra Data Centres CEO, Greg Boorer (R). Dialog IT, DXC Technology, MOQdigital, Leidos Australia, Datacom, Dimension Data and Empired are among nearly 50 launch partners for Microsoft’s new Azure Australia Central regions in Canberra. Altogether, 47 partners jumped on board for the launch of the new regions, which became available on 3 April, including global systems integrators, local IT service providers, consultancy firms and software vendors. Microsoft first revealed plans in August last year to launch two highly-secure Azure regions in Canberra, shacking up with Canberra Data Centres (CDC) in a bid to lure government agencies to its cloud platform. Slated at the time to made available in the first half of 2018, the proposed regions were aimed at focusing on government customers and their suppliers at the federal, state and local levels. Now, the two new regions have officially been made available, giving Microsoft and its partners in the local market the ability to deliver hyper-scale cloud services that can handle the “unclassified” and “protected” government data classifications required by many local public sector entities. Given the work required to achieve this level of clearance, the vendor’s new regions are limited to Australian and New Zealand Government customers. The Canberra regions have been launched offering a range of services, including infrastructure virtualisation, data management, security management and application services as a platform. The range and capability will continue to grow. With the Azure Australia Central cloud regions housed in Canberra Data Centres’ two multi-data centre campuses in the nation’s capital, Microsoft partners are likely to get a chance to vie for a greater range of government jobs, including those involving classified information. Indeed, Canberra Data Centres claims that the two multi-data centre campuses being used by Microsoft are the only commercial data centre facilities in Australia designed with the physical security controls necessary for “top secret” government data clearance. The controls at the personnel, physical, information and governance level that come with the new residency at Canberra Data Centres’ facilities also put Microsoft a step closer to inclusion on the Australian Signals Directorate’s (ASD) Certified Cloud Services List under the “protected” classification level. While Microsoft is yet to be named as a “protected”-level supplier by the ASD, it is understood that the vendor has completed the stringent assessment needed to be included on the Certified Cloud Services List. Just last week, global cloud services rival, Amazon Web Services (AWS), revealed it too had finalised its assessment through the Information Security Registered Assessors Program (IRAP), which is a prerequisite for inclusion on the ASD’s Certified Cloud Services List under the “protected” classification level. Just four suppliers have been granted the ASD’s “protected” classification status for their services: Dimension Data, Macquarie Government, Sliced Tech and Vault Systems. Although AWS and Microsoft have gone through the assessment process, official inclusion on the Government’s list as a supplier of “protected” cloud services remains up to the ASD. However, the ASD last year formally certified dozens of additional Microsoft cloud services across Azure and Office 365 as “unclassified DLM [dissemination limiting marker]”, which relates to sensitive data. Highly sensitive and classified data, meanwhile, is covered by the “protected” certification. “Microsoft has been leading the way on government security certification since we first opened in 2014,” Microsoft Australia Azure engineering lead, James Kavanagh, said. “We have completed extensive security assessments for both ‘unclassified’ and ‘protected’ data and have over 50 services across Microsoft Azure and Office 365 that have completed the formal Certification process of the [ASD] at ‘unclassified (DLM)’ level. “Our investment in physical, personnel and software security and our understanding of the sophisticated requirements of Australian Government has been a major factor in our decision to offer these regions,” he said. The new Canberra regions join Microsoft’s global cloud network, which is operational or announced in 50 locations around the world, including the company’s two existing Azure regions in Australia -- Sydney and Melbourne -- which have been operating since 2014. Unlike the Sydney and Melbourne regions, the new Canberra regions come with the capability to locate existing government systems, private clouds or specialised networking systems within the same facilities as Azure, with the possibility of direct connection under the one roof. Along with direct connectivity within the same site, the Canberra Data Centre facilities also offer direct connectivity over the Federal Government’s private Intra Government Communications Network (ICON) for direct connectivity between the two regions. “Because access to Azure Central will be tightly controlled and limited to Australian and New Zealand Government users and to approved national critical infrastructure organisations as identified by the Attorney General’s department there is a reduced risk profile for organisations taking their first steps into the cloud,” Microsoft Australia’s commercial partner director, Mark Leigh, said in a blog post. The 47 launch partners that will be able to immediately tap into the new regions include the likes of Red Hat, Cloudera, MapR, SAP, Telstra Health, AXON, Accenture, Dimension Data, Citrix, Intelledox, Gravity and GIS People – not to mention the vendor’s 11,000 or so local channel partners that will also be able to tap into the new regions. “This is such an exciting time for Microsoft and our partners because together we can make a real difference by bringing rapid innovation to the computing fabric of our nation,” Leigh said. The move is part of a broad effort by the vendor to push its cloud offering further into the government space, with the company revealing a new initiative on 27 March to deliver cloud computing skills to 5,000 public sector workers by 2020.